With the rise of environmental consciousness has come a dynamic new outlook on the way we live, the foods we eat, the cars we drive and, last but not least, the buildings in which we live and work. At Danpal, we fulfill our purpose to develop cutting-edge building materials that support the environmental needs of the planet and meet the expectations of our clients. Not all companies regard their mission in this light but for us, the products that we create are designed to last. We believe that any product with a life span should accommodate the next generation of Earth’s occupants. Danpal’s plastic roofing is just one of the products in our line that reflects this awareness of Global Vision, Local Focus. That’s the Danpal motto and it’s the way we do business. Roofing may not seem like a topic that measures up to something as broad as environmental responsibility, but Danpal’s designers and engineers reflect the company philosophy as they develop our products. Roofing is the defense system that protects a building from the invading forces of nature. 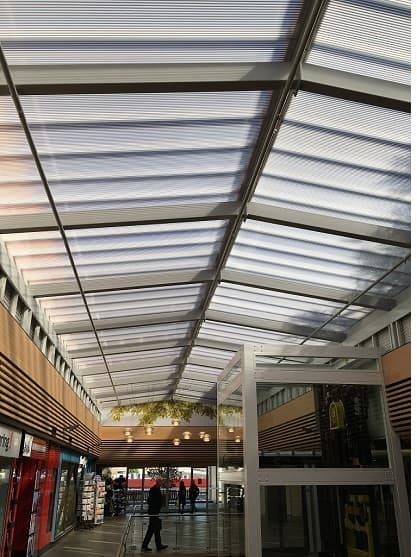 In that role, Danpal’s plastic roofing, because it’s designed to keep out moisture and drafts, is partnering with the environment so that the energy that’s used remains inside the building. There’s a lot that people don’t know about how effective plastic roofing is and we’re happy to explain why you should consider it for your roofing needs. Buildings in developed countries are the source of about 40% of the energy usage in those respective nations. That’s why plastic roofing, which is so environmentally efficient, is the smart, savvy choice for today’s eco-minded clients. Keeping energy within the building is vital. That’s why we recommend our high-quality plastic roofing. It saves on energy usage by avoiding waste, and that saves money. Any building that’s made from low-quality materials isn’t going to last against the day-to-day buffeting that it receives from weather and that’s when energy efficiency is at risk. If moisture manages to penetrate a building, it’s only a matter of time before insulation is compromised and energy is lost. Not only will you be paying for the energy that you use, but you’re also paying for the energy that’s escaping. 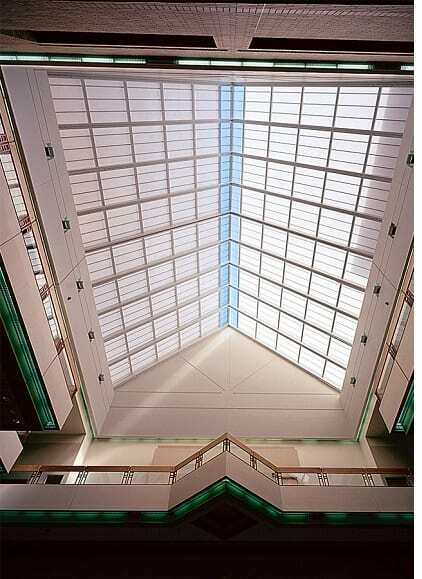 Danpal plastic roofing is designed to keep energy inside and weather outside. Part of the reason that plastic roofing is so effective at supporting energy efficiency within is that it’s so good at keeping weather outside. Nature is a powerful force and no matter in which region you live, it’s quite likely that you’ve experienced the elements. A thunderstorm, with its powerful winds and driving rain, lets us know that nature calls the shots. Or maybe it’s a furious winter storm that sends freezing temperatures, heavy snowfall, and gusts of wind that lets us know that we’re at nature’s mercy. We have the option of going indoors to escape the fury of weather but buildings have nowhere to go. It’s for that reason that they must be designed and built with the highest quality of products, like our plastic roofing. 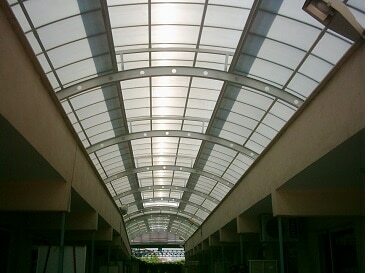 At Danpal, we provide clients with a wide range of plastic roofing solutions. 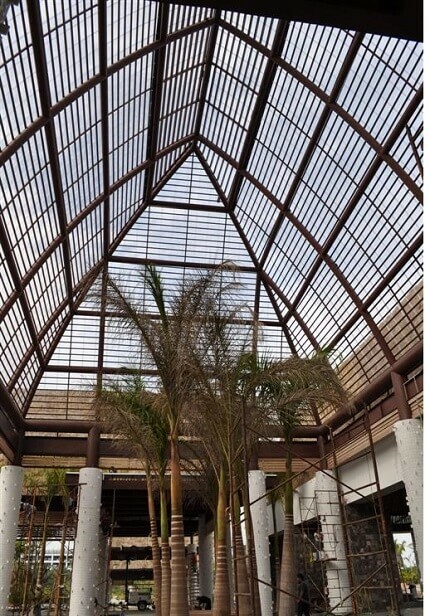 Our roofing solutions can be installed above and below all kinds of building structures. 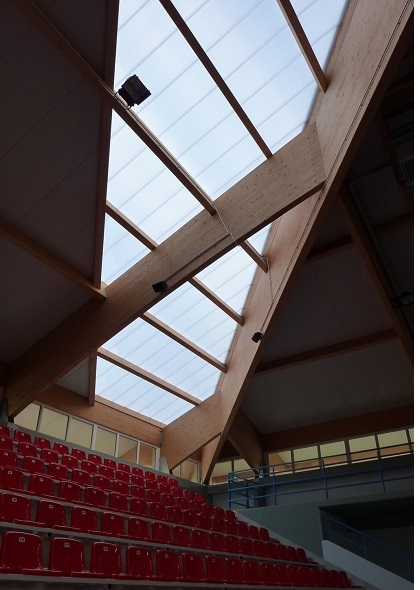 The roofing systems we offer use snap-on interlocking dry-glazed connectors. These are made from either polycarbonate or aluminium. The strong overall design quality and the quality of the materials used to create our roofing systems mean that they can be relied on to offer high impact resistance. And they’ll also handle all kinds of weather conditions. You’ll be sure to find something that suits your needs. We have a vast range of options when it comes to colors, finishes, aspects and spectacular effects, meaning we can find a solution that’s as creative as you want it to be. 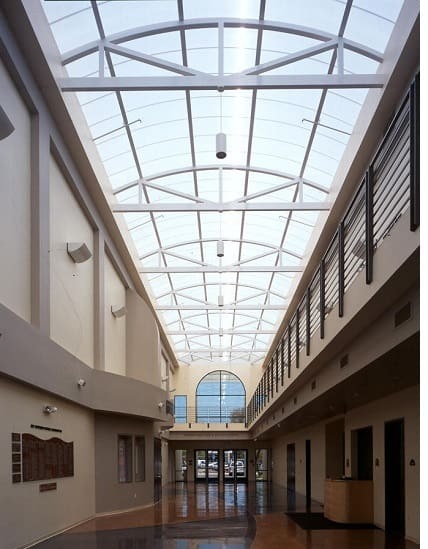 Our plastic roofing solutions offer a superior visual appearance and a unique structure that allows plenty of light into the space below. The overall look and finish of the roofing once it’s in place are aesthetically pleasing. A large part of this is down to the transparent materials we use to get that perfect balance of light that everyone is looking for but few people actually manage to find. You don’t need to look any longer, though. 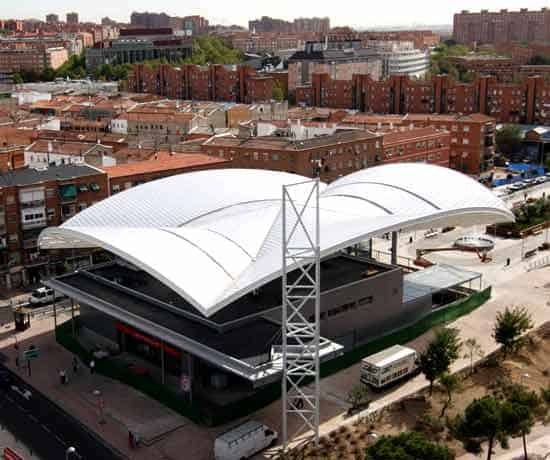 The light balance and thermal dynamics offered by our roofing solutions is second to none. The materials we use also offer fantastic flexibility. Every space needs to be light for it to feel appropriate and functional. No matter what your space is going to be used for in the end, it can benefit massively from one of our plastic roofing solutions. 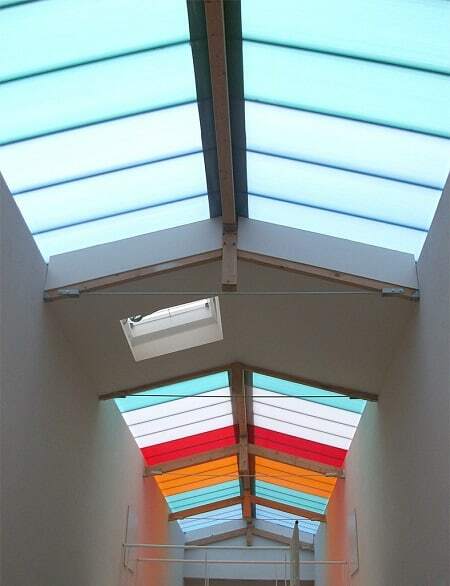 Light will flood the space and be managed in a tonally balanced way by our top of the range materials. On top of all that, our roofing solutions are always light weight, so no undue pressure will be placed on your structure, and the installation process will be as smooth and as simple as it possibly can be. That design flexibility doesn’t mean that either strength or impact resistance have to be sacrificed, though. 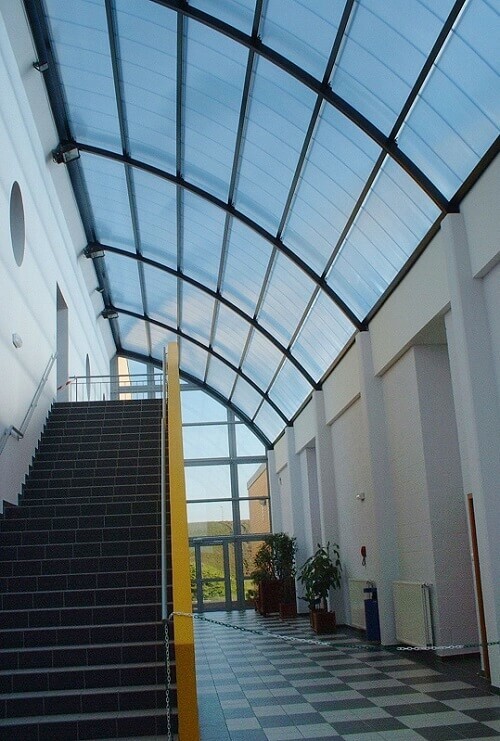 Air and water tightness are also offered by our plastic roofing solutions. When you’re relying on your roof, these things are essential. Our panels also offer you UV protection, which means your roof will stay in great condition and last longer. If you’re concerned about environmental issues, be assured that our products and methods take these things into account. Our company is run and functions in an efficient and clean way, and we make indoor air quality a top priority when designing and manufacturing our plastic roofing solutions as well. So, you can buy from us with confidence, knowing that what you buy is created in an environmentally-friendly way.